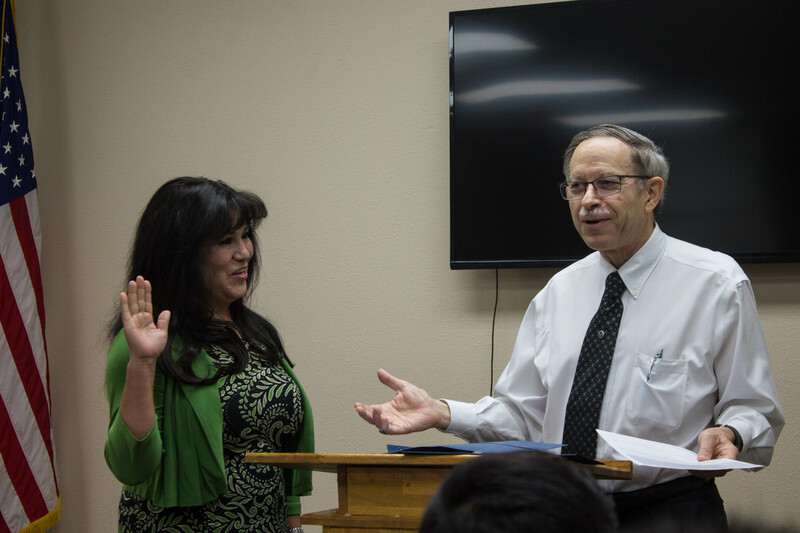 Senovia Gutierrez is officially on the Tulare Local Healthcare District’s Board of Directors. The July 11 recall election was certified on July 20, and Gutierrez was sworn in Tuesday by the Hon. Walter Gorelick, a Tulare County Superior Court judge. The ceremony, held Tuesday evening at the Tulare Chamber of Commerce, attracted a large gathering of Gutierrez’ supporters and family. Fellow board members Linda Wilbourn, Kevin Northcraft, and Mike Jamaica attended the ceremony as well as other local officials, including Jose Sigala, and members of Citizens for Hospital Accountability. Some of those attendees spoke at the ceremony before Senovia was sworn in. “You’ll have to roll those sleeves up, because it is going to be a battle,” Jamaica said. “She has sharp nails,” someone from the crowd interjected, to laughter from the crowd. “Exactly,” Gutierrez replied, to even more laughter. Sigala, a Tulare City Councilman, spoke to both praise her and explain his support for the effort to recall Dr. Parmod Kumar and replace him with Gutierrez. “When I first met Senovia I was very impressed by her, and very glad to see her vision and what she wanted to accomplish,” Sigala said. The certified results showed that 1,031 voters chose to recall Kumar and 680 chose to vote for Gutierrez as his replacement; a total of 1,037 voted in the election. The next board meeting is Wednesday, July 26 at the Evolutions Fitness & Wellness Conference Room, located at 1425 E. Prosperity in Tulare. Best news to come to our hospital since the last election. Bennie and Kumar forgot how Tulare citizens stick together when threatend by lies and untruths. HCCA, your days are numbered! Employees checks bounced! They can’t pay their vendors! what is sad the loyal employees who were dedicated to believing this community deserved a hospital, well their fate is in limbo. Now what? All the powers that be you said it was going to get ugly. Yes it is as people scramble to other surrounding communities for jobs. Now TRMC will be left with travelors that have no rooted ties to this community. Good Luck!! Now it is Devil’s turn.